For me, Memorial Day weekend is the beginning of summer. The sun is usually shining, and the weather here in Northern Virginia is perfect. One of the many great things about living in Reston is how many choices for things to do on Memorial Day weekend there are--from lounging at the pool to going on wild adventures. Here are some fun things to try out this year. The Reston Association pools will be open Memorial Day weekend. While the water is still a little cold for me, it's fun to watch all the children splashing around in the water. If you can't wait until Memorial Day to go for a swim, Ridge Heights pool in South Reston and North Shore pool in Lake Anne are both heated and will open May 10. You can buy your pool pass online, which makes it easy to be ready for opening day! Rolling Thunder is always an amazing sight. Photo courtesy of WikiCommons. For motorcycle enthusiasts, the Ride of the Patriots is a four-day event over Memorial Day weekend, with a ton of activities at (or beginning) at Patriot Harley-Davidson, located just West of Fairfax Circle on Fairfax Boulevard (Map). The highlight for many locals is Rolling Thunder® on Sunday. 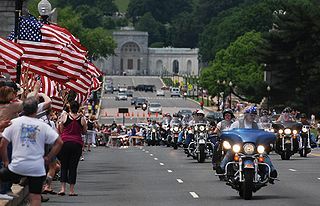 It's awe-inspiring to see thousands of motorcycles rolling toward the Pentagon, united in the cause to bring full accountability for the Prisoners Of War-Missing In Action (POW/MIA) of all wars. Learn more about Rolling Thunder and the Ride For Freedom here. Wolf Trap summer blast off! Summers on the lawn at Wolf Trap. Truly one of life's pleasures. Kick of the summer season with a free performance by the U.S. Marine Band followed by fireworks. The Filene Center gates open at 6:30 p.m. Arrive early because the park closes once capacity is reached. This is a fun event for the whole family! Honor our vets on Monday, May 26, 2014 by cheering the participants in The National Memorial Day Parade. It starts at the corner of Constitution Avenue and 7th Streets, NW and proceeds west down Constitution, past the White House, ending at 17th Street. It's a great way to enjoy Washington, DC on a beautiful Spring day, and even visit the national monuments and museums after. From the American Revolution up to present day conflicts, the Parade will commemorate the American spirit and the sacrifices of those Soldiers, Sailors, Airmen, Marines and Coast Guardsmen who serve so we can live in the Land of the Free. The parade will include floats, high school marching bands, veterans, service members, local and national celebrities, service organizations and clubs, and much more! Address: Constitution Avenue & 7th Street, NW, Washington, DC Times: 2:00 p.m.
You don't think the fun stops after Memorial Day, do you? Plan on heading down to Lake Anne Plaza on Saturday, May 31 for Northern Virginia Magazine's Annual Slice is Right Food Event. Stay tuned for more details.